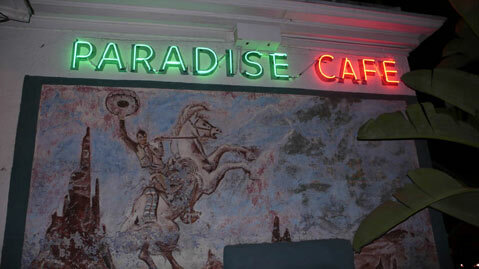 Leo Carrillo rides the Paradise Cafe mural. Days/Hours: Mon.-Sat., 11 a.m.-11 p.m.; Sun., 9 a.m.-11 p.m.
My Experience: This bar was mellow, never gritty, sometimes quiet, and always intimate. In the corner, a man in flannel cuddled a woman who looked like Helena Bonham-Carter (plus 30 years and a dash of the bourgeois bohemian), and no one seemed to notice. A busboy walked back to the floor from his break wearing the Paradise uniform: a white embroidered sweatshirt that somehow made him look slighter than he was. A preppy college student polished a glass as her friend turned a pen into jello. I go in for a dainty sip of Jim Beam, their well whiskey, and end up drawing in more as I go. This isn’t a place for strangers. There’s no one sitting at the bar. Instead, they’re cozied up in the corners and cubbyholes laughing about their long-distance wives. Above the bar, there’s a mural of an Indian brave standing triumphantly over a swooning maiden. He aims his arrow to the sky, which floats above the conifer-ed mountains like a dream — a Paradisiacal take on the trope of the horizontal Venus, the odalisque, Goya’s “La maja esnuda.” This is a Paradise that reaches back and brings forward. But not forward to the here and now, just back far enough to stoke our nostalgia. White frosted lights, teal and pink, and a big stuffed marlin tell the story. As the night went on and the patrons left, the bartender came over and asked what I was writing. I lied, and we started talking. She was open, friendly, and she just might save my night. We talked about politics, about working for too little, about the town. This was a damn fine bar, to be sure, but a bar where one needed company.